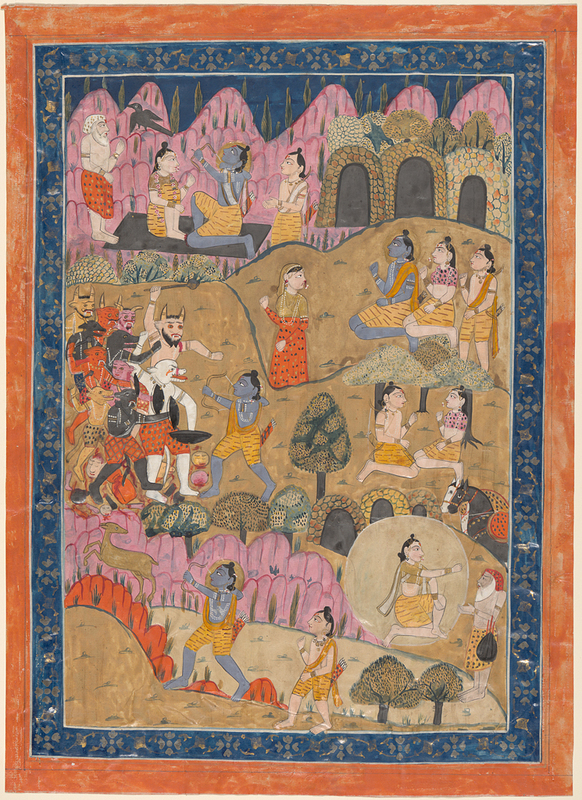 The image depicts a scene from the Ramayana, end of Chapter 6, rendered in Kashmiri folk style. Rawan and the Golden Deer, . From Ramayana of Tulsi Das. Painting. DAC accession number 1972.12.1.3. Gift of J. Aubrey Sutton (B.A. Wesleyan 1915) in memory of his father, William Henry Sutton (B.A. Wesleyan 1857), 1972. Open Access Image from the Davison Art Center, Wesleyan University (photo: M. Cook). http://dac-collection.wesleyan.edu/obj1802 is a persistent link to this page with no user-session information.